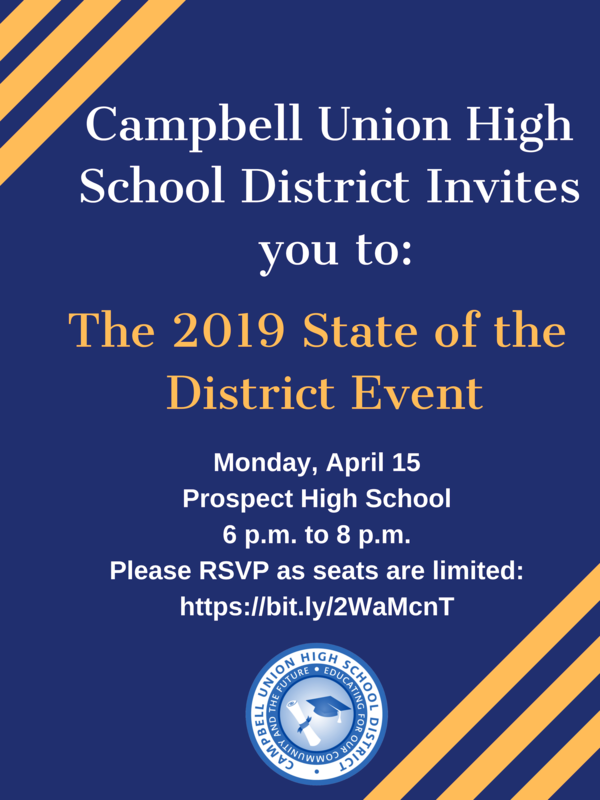 We invite you to attend Campbell Union High School District's first annual State of the District event on April 15 at Prospect High School from 6 to 8 p.m. Please attend to hear Superintendent Robert Bravo's vision to ensure all students have the building blocks to construct bright futures. We hope you can join us as we honor the successes of our students and staff and discuss the challenges our schools are facing. There will be a small reception beginning at 6 p.m. and the program will begin at 6:30 p.m Light refreshments and appetizers will be served and a translator will be provided. There will be a small reception beginning at 6 p.m. and the program will begin at 6:30 p.m.
What: Campbell Union High School District Superintendent Dr. Robert Bravo will present the first annual State of the District address. Please RSVP here.